Despina Zefkili discusses the critical and political expectations of Documenta 14. Answering the question of a spectator worried about the impact of Documenta 14 on the local art scene, Maria Hlavajova, the artistic director of BAK, in a recent talk in Athens, expressed her understanding of indigenous artists and critics’ discomfort that an ‘alien’ organism has landed in their city. She went on talking about how Manifesta 1 destroyed the art scene of Ljubljana. Without sharing the catastrophology of the later statement (or the prevailing myth of the unique energy of Athens’s local scene at present), I agree with a lot of the similes she used, because, indeed, lots of local artists and critics feel the pressure of this foreign body in the city. A body which, nevertheless, exercises the power of a big institution, although it identifies with the oppressed subjects, emphasises the poetics of the body, and adopts the role of the ignorant (‘We are ignorant’ said the artistic director of Documenta14, Adam Szymczyk, at the opening of the Public Program) or even the role of the victim (self-victimisation as a way to cope with local criticism, which has been exercised in very problematic conditions). The recent attack on Documenta 14 by the mainstream local press, adopting outrageous conspiracy theories connecting the institution with the SYRIZA government, because of the leftish rhetoric of Paul Preciado’s text inaugurating Documenta 14’s Public Program entitled ‘Exercises of Freedom’, was so hyperbolic that it seemed almost manipulated. These articles, along with the romantic arguments of certain local curators trying to defend Documenta 14 or other obsolete opinions speaking of art’s autonomy and questioning the artistic quality of talks and other not-strictly artistic events which took part during ‘Exercises of Freedom’, blurred the discussion and did not leave space for serious institutional critique. This institutional critique of Documenta 14, and the way it deals with the local art field remains, and should continue as the exhibition unfolds, since we cannot yet tell how it will use what it ‘learned from Athens’. However, some initial conclusions can be drawn. Talking about the working title ‘Learning from Athens’, Szymczyk recently emphasised the fact that Documenta 14 is working in Athens. 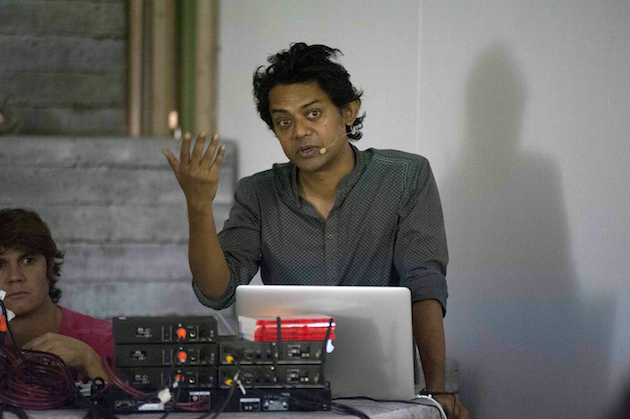 He said Documenta14 is more than an exhibition, it functions more as a ‘performative action’ which aims to change the status quo, and one way of doing so is by inviting approximately one hundred artists to Athens and observe what is happening here in a new way, thus changing the status quo. As far as this change is concerned, we are waiting to see more valuable interventions in the future than the exploration on the turbulent local history performed by the ‘Exercises of Freedom’, a twelve-day event which took place in the Municipality Art Center in Parko Eleftherias (Freedom Park), which hosted the headquarters of the military police during the 1970s junta. Because Documenta 14’s much-discussed involvement with the theme of the Greek junta was in many cases overly nostalgic, sentimental and confident, offering easy meanings instead of activating regions where history is fragile and fluid. A characteristic example is the Dictionary of Greek military junta LTI – Lingua Tertii Imperii by artist Daniel G Andujar, which being the only publication of the ‘Exercises of Freedom’ acquired an extra importance. This simplistic and superficial recording of the junta through archive images, sometimes contrasted with images of ancient statues with visual similarities, does not propose a different reading of history but remains at the level of first optical connections. Naeem Mohaiemen, opening of the Public Programs of documenta 14 at Parko Eleftherias, photo: Stathis Mamalakis. Courtesy of Documenta 14. Counter to this is the Red Star, Crescent Moon/after Sohail Daulatzai by Naeem Mohaiemen, the most interesting work I saw during ‘Exercises of Freedom’, draws on the most valuable tradition of archival art, exploring histories of the left and lost utopias, with references to Bangladesh of the 1970s, which has a lot to tell us, even for today’s Athens, through an effortless projection of items from another context to the local condition. It is always welcoming to have an artist from abroad thinking on the local condition as long as he/she moves beyond the seduction the first sight and does not adhere to a superficial interpretation of local history. 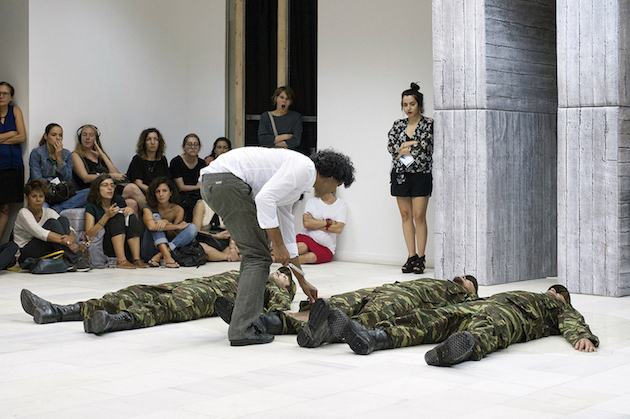 Interventions, such as Sergio Zevallos’ performance Educación Cívica/Education in Civil Society, where men dressed in military uniforms shift between violence, hugging and Syrtaki dancing, or anthropologist Neni Panourgia’s talk ‘Chronotopes/Dystopic Geometries/Terrifying Geographies’, a highly emotionally charged tour from Parko Eleftherias to Makronissos (a prison island during the civil war and junta), activate already shaped perceptions and fail to create shifts in the established narratives, as promised by ‘Exercises of Freedom’. How productive is it to remember in such an emotional context the already mythologised history of the Greek left and how does this differ from the way it is celebrated in the local school anniversary of the Athens Polytechnic uprising of 1973 (a massive demonstration of popular rejection of the Greek military junta)? If you add to this nostalgic re-reading of resistance the inevitable references to ancient Greece and an overwhelming performativity and theatricality, which characterised many of the Exercises, engaging easy emotions and romanticism, the first impressions you have of Documenta 14’s take on the local context is a sensory and exotic image of Athens, emphasising strong, charming images produced to captivate an international audience. Sergio Zevallos, Educación cívica (Staatsbürgerkunde), performance, 2016. Photo: Stathis Mamalakis. Courtesy of Documenta 14. Documenta 14’s emphasis on corporeality and affect is an interesting approach towards the rethinking of the mega institution, as well as its post-ethnographic institutional critique, performed for example by Clémentine Deliss and Frédéric Keck’s talk on the urgency of remediating ethnographic collections in ‘Occupy Collections!’ in South Magazine 7, Documenta14, Issue 2, presented as part of the Public Events Program. Nevertheless, they were absorbed as part of the multicolored, festive anti-colonial, anti-capitalist front of a ‘trans South’, celebrated by the ‘Exercises of Freedom’. The same goes for the emphasis on queer issues and culture, a valuable statement in a homophobic time for Athens, which nonetheless seems to be exoticised, and tailored to the global audience, as we can guess from the upcoming ‘Society of friends of Sotiria Bellou’ (1921–1997), the most famous singer of rebetica, and a political activist and open lesbian), which will focus on the connection between rebetica music, queer politics and gambling. It is one section of the Societies of Friends, a kind of working group open to the public, which will be formed as part of the Public Program in the near future. Another central point of interest announced by Documenta14 is the dialogue between radical left and indigenous cultures, which we hope will go further than symbolic and descriptive gestures, like wearing an indigenous poncho to Toni Negri or putting a marble tent on Philopapou Hill opposite the Acropolis to raise awareness on the refugees crisis, a work by Canadian artist Rebecca Belmore with roots in the wigwam dwellings of the Anishinaab indigenous Canadian population. The hyperbolic trust on the sensational aspect of experience seems at times a bit naïve, judging from the emphasis given to the way artist and architect Andreas Angelidakis’s installation DEMOS was supposed to act as a catalyst ‘avoiding positioning the audience as aesthetic visitors or neoliberal consumers’. Angelidakis’s soft architecture consisting of sixty-eight blocks resembling ruins (‘the ruins of a democratic parliament?’) were assembled and re-arranged in different ways, hosting the ‘Parliament of Bodies’ created through the thirty-four ‘Exercises of Freedom’. The architecture indeed helped the audience feel as one; nevertheless we have experienced similar viewing conditions in many exhibitions, while Angelidakis’s attempt to connect the ancient ruins with the aesthetics of the Greek polykatoikia (blocks of flats which clumsily filled the cities from the ‘1970s onwards, replacing old housing) seemed equally schematic and descriptive as the similar salon (‘Crash Pad’) he created some years ago to host the Parallel Events of Berlin Biennale 8. A lot more interesting was Angelidakis’s faux restoration of the comme il faut Municipality Art Center on the occasion of the ‘Exercises of Freedom’, which excavated the repressed traumatic history of the building by opening holes in the plasterboard ceilings covering the building’s skeleton and by opening again the back of the building, restoring its communication to the building below, which now houses the small ‘hand-made’ Museum of Antidictatoric Struggle. 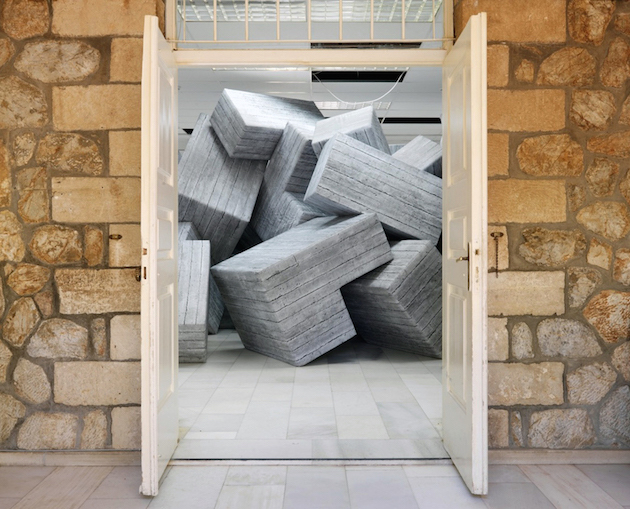 Andreas Angelidakis, DEMOS, installation, 2016, dimensions variable. Photo: Stathis Mamalakis. Courtesy of Documenta 14. Even though it chooses to identify with the ‘trans south’, to give speech to the ‘other’, and disrupt the status quo, Documenta 14 did not cease to be a mega-institution imposed on a small peripheral scene with many pathogens, currently living its fifteen minutes of fame as a southern experiment of creativity and flexibility in times of crisis. So why does it come to learn from Athens? How does it converse with the local scene? In how many and which parts of the local producers of discourse does it give space and importance? In what positions and roles have the local art practitioners been used? What will be inscribed in global art history from the local artistic production for the researchers of the future (because dominant or ‘revolutionary’, Documenta14 will remain in the future a point of reference for the way in which history is written)? Obviously, Documenta 14 did not have space for all the most interesting Greek artists and theorists. But given its working title, it has a certain responsibility to ‘represent’ Athens, even as a city – as a symbol in a certain momentum. And consequently, this Documenta 14 has a lot to think about how (and if) it challenges colonial and orientalist mechanisms (especially when using the anti-colonial element as a flag). Is the much-emphasised co-operation with the local institutions enough in a country like Greece, where a few institutions’ contribution to the production of knowledge in the contemporary art sector involves a very limited and specific aspect of the whole picture? Which Athens will visitors from abroad see? To what extent will the charming mixture of antiquity, crisis, resistance and rebetika confirm or challenge their existing preconceptions? How important is it, after all, for Documenta 14 to deal (as part of another upcoming Society of Friends possibly entitled ‘The Greek indigenous’) with the tag ‘Dear Documenta, Please don’t exoticise us’ signed by indigenous Greek artists on the walls of the artist-run space of Athens School of Art, when texts like Preciado’s ‘Qui la dette grecque réchauffe-t-elle ?’ in Liberation present the most vivid exoticisation of the Athenian landscape as the place par excellence for fantasising the creation of resistance towards the international collapse of democracy, dignity and the welfare state? Despina Zefkili is an art critic and senior editor of Athinorama, the leading cultural guide to Athens. She is interested in a critical understanding of art in a wider sociopolitical context as well as its performative and educational aspects. She has published articles on the Athens art scene in international books and magazines including ‘On One Side of the Same Water’ (Hatje Cantz), ‘The Way between Belgrade and Prishtina’ (Stacion Center), Art Papers, Third Text, and has reviewed exhibitions for Frieze, artnet, Flash Art, ArtInfo.com and South Magazine. Zefkili is a member of the Temporary Art Academy (PAT) curating the ‘Soft Power Lectures’ at Actopolis Project, and was a member of the production team of the 4th Athens Biennale AGORA. She has curated a series of events around performance lectures in the Museum of Cycladic Art, Athens. Together with Vangelis Vlahos she co-curated the exhibition ‘Archaeology of Today?’ at Els Hanappe Underground and co-edited Local Folk from 2004 to 2008, a free press publication, focusing on a critical view of local art production and a dialogue with other art scenes.